It’s the International Year of Soils, so we’re thinking about what lies beneath our feet. 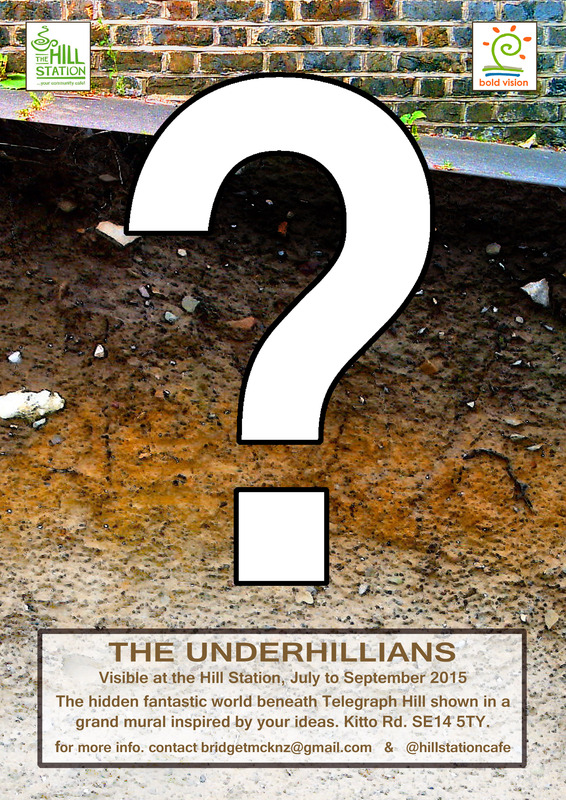 We’re developing a project called The Underhillians. Brian McKenzie is working with some local artists, planning a spectacular mural for the Hill Station. The mural will depict the amazing world of mysterious dwellers beneath Telegraph Hill. We think there might be creatures a little like humans underfoot, and all kinds of animals too. There might be connecting tunnels and chambers, or places like the skate-park and schools, and different ways of living, working and having fun. We’re calling out for imaginative ideas about what might be going on underground, the creatures there and how they live. People are invited to make drawings and notes on A5 cards, and to hand these in to the Hill Station staff before Monday 29th June. These will be used to inspire the mural and the drawings will be displayed as part of the project.